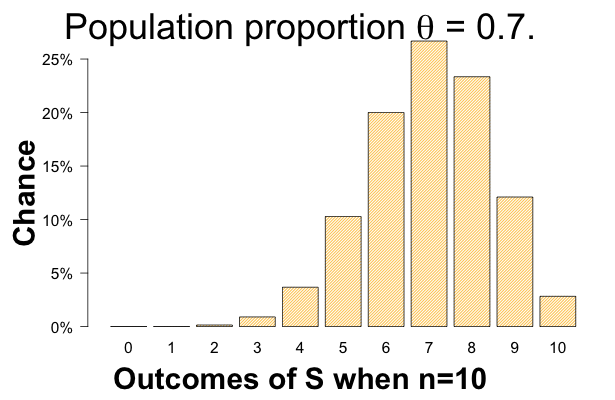 In this blog post we elaborate on the ideas behind Harold Jeffreys’s Bayes factor and illustrate this test with the Summary Statistics module in JASP. In a previous blog post we discussed the estimation problem, where the goal was to infer, from the observed data, the magnitude of the population effect. Before studying the size of an effect, however, we arguably first need to investigate whether an effect actually exists. Here we address the existence problem with a hypothesis test and we emphasize the difference between testing and estimation. The outline of this blog post is as follows: Firstly, we discuss a hypothesis proposed in a recent study relating fungal infections to Alzheimer’s disease. 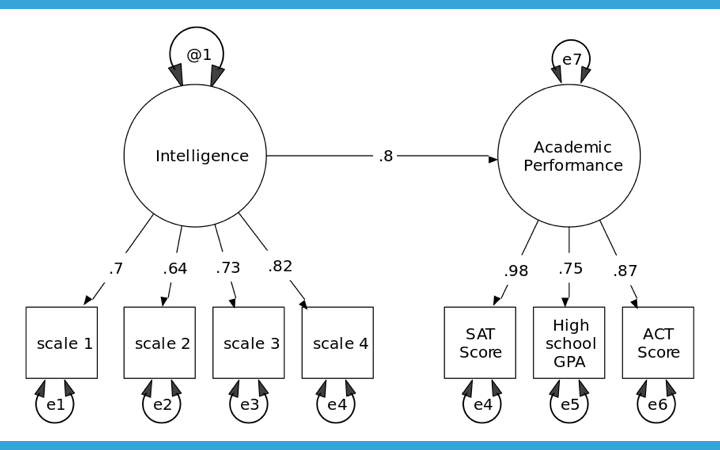 This hypothesis is then operationalized within a statistical model, and we discuss Bayesian model learning in general, before we return to the Alzheimer’s example. This is followed by a comparison of the Bayes factor to other methods of inference, and the blog post concludes with a short summary. This hypothesis was proposed by Pisa, Alonso, Rabano, Rodal and Carrasco (2015), who conducted an experiment to assess the evidence for this null hypothesis. The alternative hypothesis is denoted by and implies that not all Alzheimer’s patients have fungal infections. Note that the hypotheses are statements about the population consisting of all (i.e., past, present, and future) patients suffering from Alzheimer’s disease. As we will never have this population at hand, we cannot check every patient for fungal material, and we can never be 100% certain that the hypothesis holds true. Due to sampling error, statements about the population such as do not transfer directly to the relatively small samples of patients. To account for this error we assume a statistical model for the data. The data will consist of the number of successes and the number of failures , where is the number of Alzheimer’s patients where fungal material are found from a sample of size . The standard model for this situation is known as the binomial distribution which depends on the sample size and the binomial rate parameter . which implies that if the hypothesis that is concerned with the population holds true, then every Alzheimer’s patient in the sample has fungal material in his or her brain. In other words, before the experiment is run and if the null holds, then the outcomes are predicted to occur with 0% chance, while is predicted to occur with 100% chance. by which we mean that there is some fixed, but unknown, proportion of the Alzheimer population that have fungal material in their brains. For instance, if and , then there is a 24.6% chance to observe , a 20.5% chance to observe , and a 11.7% chance to observe successes. In fact, there’s a small chance of 0.098% to observe successes. Similarly, if then there’s only a 10.3% chance to see 5 successes, a 20% chance to see 6 successes, and a 26.7% chance to see 7 successes. Likewise there’s a small, but non-zero, chance to see successes out of , see the figure below. The alternative hypothesis implies that any strictly between zero and one is possible. Note that we used the model to reason from the hypothesized general population to all possible outcomes, denoted with a capital before the experiment is run. Furthermore, the predictions are stochastic meaning that they are expressed as chances. where refers to the Bayes factor in favor of the null over the alternative provided by the data . As we explain below, the Bayes factor quantifies the relative predictive performance of the rival hypotheses. For instance, if then the posterior model odds will be two-and-a-half-to-three and leads to and . While if then the posterior model odds will be four-to-one resulting in and . Note that if , we automatically have , which implies that we have no doubt that the null holds true. For these prior model probabilities we automatically get and regardless of the data that are observed. Hence, setting (or ) implies that we are not open to learn from data, and we therefore assume that is strictly between zero and one. It’s worth mentioning that Bayes factors are not the same as posterior model odds, and that Bayes factors do not depend on the prior model probabilities and . At the time of writing, there’s no general option yet to specify prior model probabilities in JASP, but the program does provide Bayes factors. One of the advantages of the Bayes factor is that we can focus on the evidence provided by the data, and let everybody update their own model priors. where in the numerator is a number, which is retrieved by evaluating the binomial likelihood at the null hypothesis given the observed number of successful counts and sample size . Similarly, in the denominator is a number for each possible between zero and one within the alternative model. since the sum of the successes and failures equals the size of the samples . The function is also referred to as a prior, and could be thought of as the experimenter’s uncertainty about the unknown within the model , which we distinguish from the experimenter’s between-model uncertainty expressed by and . According to my reading of Jeffreys, in his Bayes factor construction does not reflect prior knowledge; instead, can best be viewed as a weighting function necessary to convert the likelihood function of the alternative model into a single number. More specifically, for the integral sign implies that at each possible in the likelihood is multiplied with the weight and, subsequently, summed. As such, is a weighted average, i.e., the marginal likelihood, and leads to a number. As a result, the Bayes factor is a ratio of two numbers and therefore a number itself. For the binomial model, we typically use for the beta distribution with hyperparameters and . 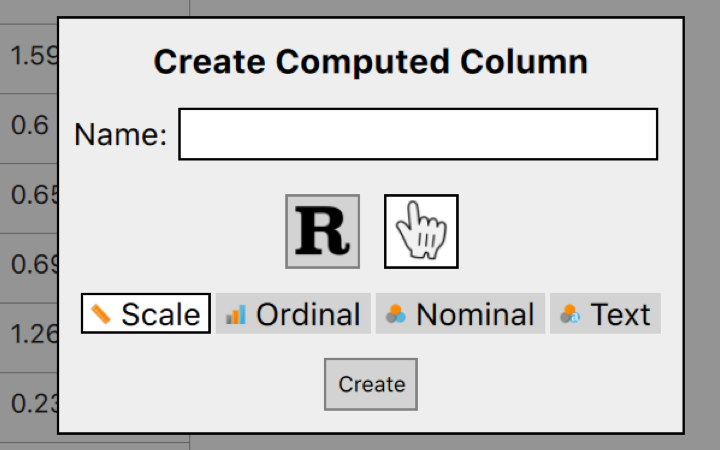 In JASP and is set by default, but a user can change these values. To get a better understanding of , we first activate the Summary Stat module in JASP by clicking the “+” sign, and then go to “Frequencies” followed by “Bayesian Binomial Test” and tick “Prior and posterior” and “Additional info” under ”Plots”. 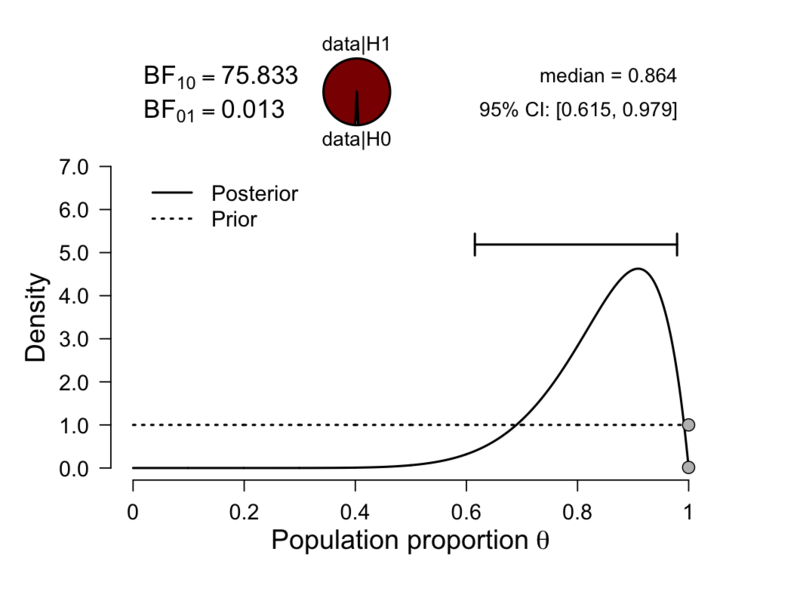 The default beta prior for with and is shown to be the uniform distribution. Note that the results of the analysis appears immediately, and after selecting in the user interface, JASP reports a Bayes factor of in favor of the null over the alternative, which provides direct evidence in favor of the experimenters’ working hypothesis over the alternative and leads to the the following plot. This equation implies that is equal to the posterior for the parameter within the alternative model divided by the prior at the test point, in this case, . Hence, for the test the focus in these prior and posterior plots should be on the relative heights of the dots. In this case, the posterior evaluated at is at height 11, whereas the prior evaluated at is at height 1. To highlight that the Bayes factor does not equal the posterior model probabilities, note that for the skeptic a Bayes factor of implies that her prior model odds of one-to-three are updated to eleven-to-three resulting in and . Hence the skeptic cannot rule out either hypothesis after observing the data, but she can conclude that the null hypothesis is now more likely than it was before. The analysis based on has some interesting properties, as with this setting –and as long as we see no failures– each additional success increases the evidence for the null over the alternative by one. For instance, entering successes in JASP instead of , we immediately get . In general, with and for we get . For instance, if then each additional successful observation increases the evidence by a factor 8, as we then get and . The hyperparameter controls the growth rate of the evidence with respect to as long as , thus, . Mathematically, we say that is of the order , which implies that if the Bayes factor grows quickly, while for slowly, and for linearly. The following plot depicts the three cases. Each curve in this plot represent Bayes factors with as a function of based on . For the dotted brown curve we have and observe a very slow increase. 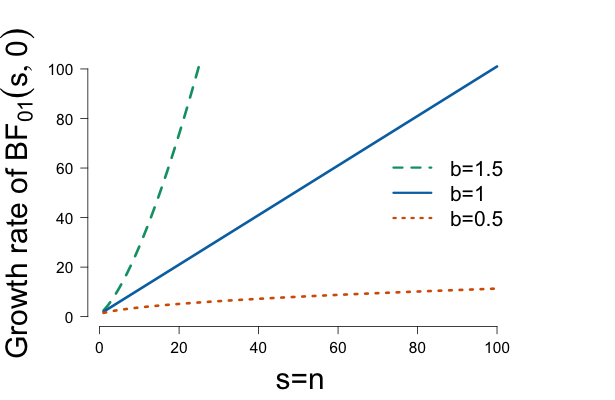 The solid blue curve shows the case with , and the dashed green curve is based on resulting in a Bayes factor that grows so quickly that it runs off the chart. Entering the last case in JASP shows that with and we get . 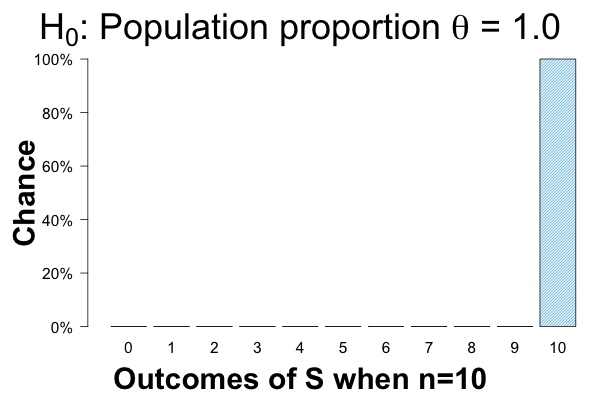 Regardless of the chosen and , each curve increases, which implies that observing only successes from a larger sample provides more evidence for the null than from a smaller sample. For any sample of size consisting of only successes , the Bayes factor remains bounded and, thus, , which implies that the alternative is not ruled out with certainty. For instance, with and the Bayes factor is and the skeptic’s posterior model probability for the alternative remains then . This number may be small, but it is not zero. The Bayes factor follows the rule of inductive reasoning; as long as only successes are observed, the evidence for the null keeps increasing. At the same time, no matter how many successes we have already observed, the alternative hypothesis can never be ruled out with certainty, i.e., . 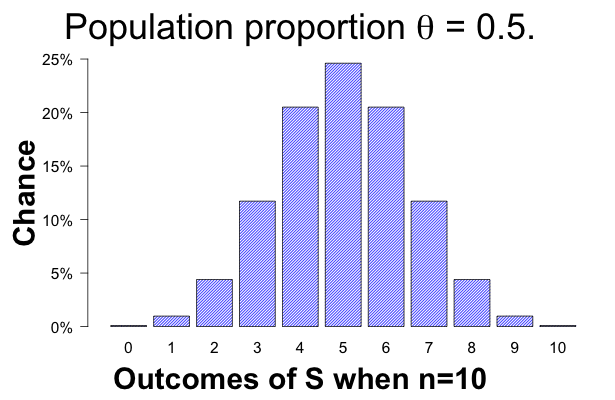 A posterior model probability of , thus, implies that we argue that “because all swans we have seen so far are white, we have proven that all other swans must also be white”. 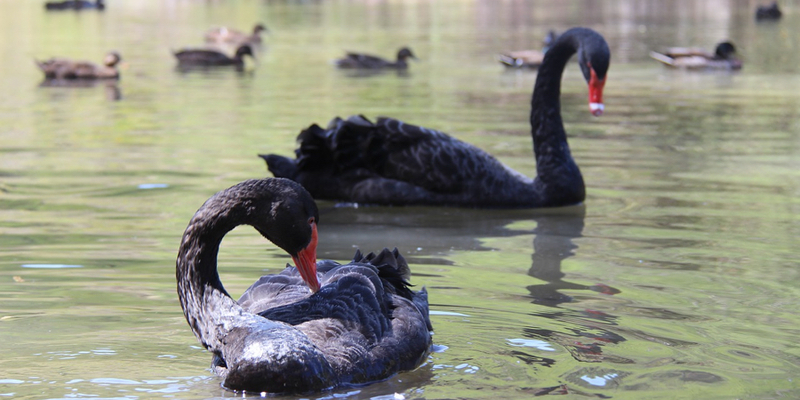 However, the general statement that “all swans are white” is logically false as soon as one black swan is observed. Similarly, the observation of a single Alzheimer’s patient without fungal material in the brain decisively falsifies the null hypothesis that all Alzheimer’s patients have fungal material in their brain. Suppose now that the experiment is continued, and we observe an Alzheimer’s patient without fungal material, resulting in successes and failure. Entering these observations into JASP shows that , which implies that as long as . In other words, the observation of one single failure utterly destroys the null hypothesis , as it should. The null hypothesis, however, will not be destroyed, if we mistreat the testing problem as one of estimation. As discussed in a previous blog post, when estimating the effect, we can focus on the posterior median of that serves as a best guess for the magnitude of the effect, and the 95%-credible interval can be used as a measure of uncertainty about this best guess for . The difference in behavior between the Bayes factor and can best be explained by the different questions these two quantities try to address. The Bayes factor takes the null seriously, addresses the existence problem and updates the prior model odds to posterior odds. In contrast, quantifies the uncertainty about the magnitude of the unknown parameter , which by assumption is not fixed at one. In other words, a pre-condition of and is the null being false, and the alternative being true. The -value also destroys the null hypothesis once a black swan case is observed, however, it does not gradually accumulate evidence in favor of the null, or communicate uncertainty whenever only successes are observed, i.e., when for increasing. For a sample of size resulting in successes, thus, , we get as displayed in the far right column of the main table of the JASP output screen. Hence, a single failure will cause the null hypothesis to be rejected at any positive level of , no matter how small. On the other hand, when and , thus, , we get , but this is also the case for any other . Hence, for the null hypothesis under test, the -value is indifferent to the size of the sample, which provides a concrete demonstration of the fact that the -value does not quantify learning or evidence here. As is larger than any chosen , and in particular, the decision is then to not reject the null. This sounds like good news, as the experimenters wanted to provide evidence for the null here. Unfortunately, not rejecting the null does not imply that we can accept the null hypothesis as true. On the other hand, whenever , for instance, then the -value is the sum of the chances of observing and , which are all zero whenever . Summing all these zeroes yields again zero, which is why we get . It is interesting to note that to calculate the null is presumed to be false and not taken into account at all, whereas to calculate a -value the null is assumed to be true and the alternative is not taken into account at all. For the calculation of a Bayes factor, in contrast, both the null and the alternative model are taken into account. The -value and the Bayes factor are both methods for testing, but it is good to realize that they have different purposes. The procedure to reject the null when focuses on all-or-none decision making, whereas the goal of a Bayes factor is to quantify the graded evidence provided by the data in favor of the null over the alternative. With a more graded assessment the substantive experts –and not the statistician– can make the decision to accept or reject the null hypothesis, if such a decision is required. In practice, we always make decisions under uncertainty, and for transparent reporting, we should also communicate the uncertainties with which we make these decisions, for instance, using the Bayes factor and the posterior model probabilities. The decision itself might have profound consequences. For instance, acceptance of the null might imply further research on the fungi hypothesis and the development of new synthesis techniques of specific anti-fungal antibodies, whereas a rejection might lead to the funding of another stream of research, which might require a new brain scanner. Both these policies come with costs. By acknowledging and taking the model uncertainties into account (i.e., not only the decision of accept or reject) in our forecasts, we can better assess the risks of the two policies. More convincing than plain statistical evidence, would be to discover the mechanism with which the fungi causes Alzheimer. The authors seem to be well aware of this fact and also focus on this aspect of the research. Nonetheless, we believe that the analysis based on the binomial model provides some statistical insight. Firstly, we mentioned the limits of inductive reasoning, which we believe affect all statistical methods, whether Bayesian or frequentist. The black swan example illustrated that it is impossible to prove a causal claim from observational data alone. In future blog posts, we elaborate on other ideas of Jeffreys regarding the Bayes factor. Thanks to Eric-Jan Wagenmakers, Tim Draws, Maarten Marsman, and Alexander Etz for their comments on an earlier draft that helped me to write this blog post. 1 This is an oversimplification, as Pisa et al. (2015) is a replication of their own work where they first investigate one Alzheimer’s brain before they considered ten others. Moreover, to further simplify the analysis, we ignore the fact that Pisa et al. (2015) also studied the brains of controls. 2 In fact, the Pisa et al. (2015) is a replication study of their previous finding, which might be interesting to study using replication Bayes factors. Jeffreys, H. (1961). The Theory of Probability. Oxford University Press, Oxford, UK, 3rd edition. Ly, A., Raj, A., Etz, A., Marsman, M., Gronau, Q. F., & Wagenmakers, E.-J. (2018). Bayesian Reanalyses from Summary Statistics: A Guide for Academic Consumers. Advances in Methods and Practices in Psychological Science, 1(3), 367-374. Ly, A., Verhagen, A. J., & Wagenmakers, E.-J. (2016a). Harold Jeffreys’s default Bayes factor hypothesis tests: Explanation, extension, and application in psychology. Journal of Mathematical Psychology, 72, 19-32. Ly, A., Verhagen, A. J., & Wagenmakers, E.-J. (2016b). An evaluation of alternative methods for testing hypotheses, from the perspective of Harold Jeffreys. Journal of Mathematical Psychology, 72, 43-55. This is reply to Christian Robert’s comment, and to Suyog H. Chandramouli and Richard M. Shiffrin’s comment on our previous paper in which we summarize the ideas of Harold Jeffreys on hypothesis testing. Pisa, D., Alonso, R., Rábano, A., Rodal, I., & Carrasco, L. (2015). Different brain regions are infected with fungi in Alzheimer’s disease. Scientific reports, 5, 15015. Alexander Ly is the CTO of JASP and responsible for guiding JASP’s scientific and technological strategy as well as the development of some Bayesian tests.